A24 is selling this as a quirky post-Wes Anderson movie with cute kids in adult-ish situations and Willem Dafoe, and I'd gone to see it with that expectation in mind. It's far darker and more squalid than the trailer and the first teaser poster would suggest. I had a strong reaction to it, but if I went in expecting something more like the first third of Moonlight I would probably have enjoyed it more. YMMV, of course. I'm suprised. I didn't know much about the marketing, I just knew "was directed by the guy who directed tangerine" so it was about how I expected. I really really adored the movie. But I could see it being a bummer if one went in with different expectations. This was the best movie of the year so far. It combined being clear-eyed with immense compassion, which I think is a very difficult feat to pull off. Everyone in this gave amazing performances, especially Moonee and Willem Dafoe's character. This may be the best performance I've seen from Dafoe. I can't express how much I loved this film and how moving and heartbreaking I found it. I loved it, and I thought the ending was so perfect - pop goes the bubble. I went in with no expectations and I was mesmerized. That Moonee was a pistol. I hope someone takes good care of the actor who played her if she chooses to stay in the entertainment industry. 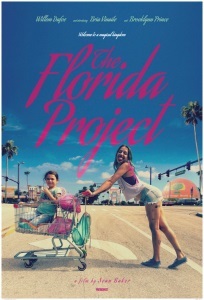 Florida Project was one of my favorites of all of 2017. I should also say that this is a movie I probably wouldn't have seen in the theater without MoviePass, but I am really glad I did. Be warned this is not a plot-driven movie. It is entirely a character-driven movie. Dafoe is getting all the accolades, but this is Moonee's movie. The last 5 minutes of this movie are about as gutting, gripping and emotional as cinema can be. And and utterly amazing acting job from Moonee. I don't think I've ever seen anything better represent the secret life of children. This is an astonishing film. There didn't seem to be any bad main characters, in spite of everyone's fragility and precarity. Halley was the best/worst mom ever, and the spiral of poverty was so realistically presented. Every Republican who's ever used the term welfare queen should be forced to see this film. While there was danger on the periphery, and always the pall of poverty, for the kids, it was one long enchanting adventure all the way to the end, but then what? I could easily imagine Moonee and Jancey hiding forever in the park, sleeping every night in the castle of the magic kingdom, just like Claudia and Jamie at the Metropolitan Museum of Art. I loved this movie and I'm kicking myself for waiting so long to see it. This movie was so real and raw that I kept feeling as though it must be some sort of documentary.